GATLINBURG, Tenn. -- A Tennessee mayor says three more bodies have been recovered after the wildfires in the Great Smoky Mountains, bringing the death toll to seven. Sevier County Mayor Larry Waters said Wednesday that officials believe more than 400 buildings have been damaged in the county. He also noted that three people who were trapped after the wildfires Monday night have been rescued. He did not go into details about the rescue, and said authorities have not positively identified the dead. He says search-and-rescue missions are ongoing. Authorities say the wildfire that spread embers and flames into Gatlinburg, igniting new blazes and forcing thousands to evacuate, is now 10 percent contained. Officials say it’s the third-largest ongoing fire in the Southeast. 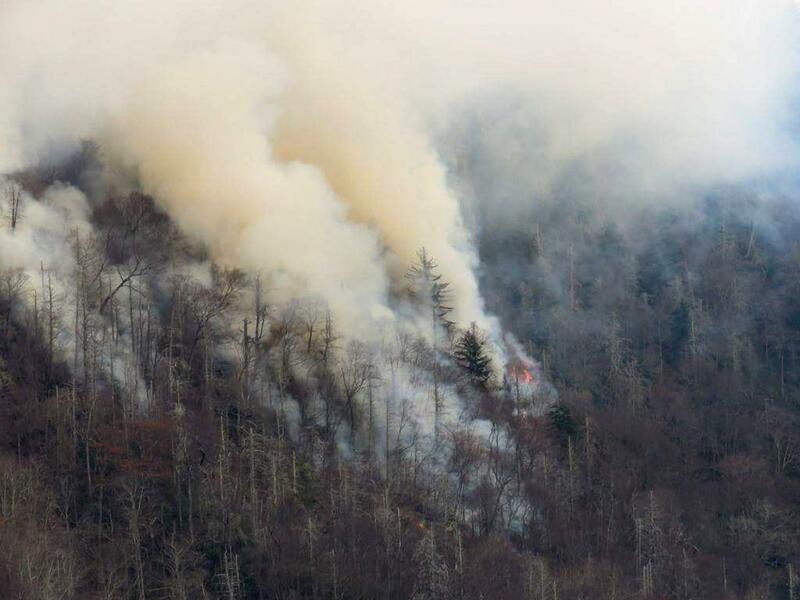 A Wednesday report from the federal team managing the blaze says the Chimney 2 Fire in Great Smoky Mountains National Park is more than 15,600 acres - about 25 times the size of the University of Tennessee’s main campus in Knoxville. Though rain has fallen Wednesday, fire officials say the wildfire threat isn’t over. Bonnie Strawser, with the team of fire officials working to suppress the blaze, said the fire “could still rear its head.” Strawser said rainfall reports Wednesday night or early Thursday should provide a better picture of how much rain has fallen on the fire. More than 14,000 people were forced to evacuate Gatlinburg and Pigeon Forge, as wind gusts of almost 90 mph pushed the flames down from the mountains. Roads heading into Gatlinburg remain closed to traffic, CBS affiliate WTVF reports. None of the deceased have been identified. It’s unclear as to how many people remain unaccounted for. A Memphis couple, who were vacationing with their three sons, have been missing since Monday. Their sons - Branson, Jared and Wesley Summers – were taken to Vanderbilt University Medical Center for treatment. The Tennessee Bureau of Investigation has set up a hotline (1-800-TBI-FIND) to coordinate reports of missing persons. Callers need to provide as much identifying information as possible, including names, phone numbers, vehicle identification, and last known whereabouts.